Yesterday evening marked the beginning of our guild-activity series. The poll decided that we’ll go with Cyrodiil PvE first- that means going in there, unlocking skyshards, finish delves and dolmen, explore places and so on. Questing might be part of it, but it’s a sidenote. As we aren’t into PvP, we’ll begin in Aldmeri Dominion territory and simply hope for the best. The best being no enemy players around, all the more as we couldn’t join the non-veteran campaign due to one of us being in their veteran ranks. I’d have thought they get scaled down, but apparently, this campaign is for <50 players, stat. Of course, there’s still tension. After all, enemy players can be anywhere in the landscape, in delves and as you are able to see dolmen/anchors from far away, there’s enemies to be expected. First of all, i’ve got to say that i love this. I wouldn’t want it all the time, but when traveling through Cyrodiil (or mining in a 0.4 sec system in EVE), i’m always on the lookout for others and there are things to be considered as soon as you see enemy players. So it happened when we met others- a small group of maybe two or three players in one of the delves we ventured in- the Pothole Caverns. I couldn’t make out how many there were, because they went into stealth as soon as they saw us. And that’s when it became really interesting- this group was in a delve, after all, so it was entirely possible that they didn’t want to seek out fights, but so aren’t we and we still fight enemy players when we see them (we don’t hunt them, though). They could also be hiding and sneaking around to attack us. We were hidden by that time, as well, and i don’t know enough about the stealth mechanics in pvp to know how we’d be able to see them. I sneaked around a bit, then i decided to come out of my cover- maybe lure the enemies into attacking us. Nothing happened. Still, can’t be sure, right? So the next thing i considered was that they were waiting for us to get engaged in a fight with the mobs around- so i started a fight. Again, we were not attacked. We relaxed a bit, but when it came to the delve boss, i became cautious once again- they could be lurking out there, waiting for us to clear the way and then “steal” the bossfight from under our feet. But they weren’t. I don’t know where they went, but we never fought them- at least not in this place. After some time, we travelled to Vlastarus for a skyshard. Vlastarus is in Aldmeri Dominion territory, if the map is in its initial state. Yesterday, it was at the border to the Daggerfall Covenant, so all kinds of stuff happened- there were DC guards and three enemy players. This time, we got into a fight. While we were first just looking at one enemy and still considering whether and how to attack them, they took their chances when a guard attacked us. And there were some friend, as well. It was a very interesting, not too short fight with some players and npcs- and it was a lot of fun. Made even sweeter by our victory. When we went to tackle an anchor, i advised our group to avoid standing too close to each other, because i didn’t want enemy players to hit all of us with one AoE attack. Surprisingly, nothing pvp-related happened there, though. Then, we called it a night. But “calling it a night” in Cyrodiil means trying something new and exciting. So we decided to attack a mine owned by the Covenant close to one of our castles or towers- to teleport to the southwest and then use the wayshrine to get out of Cyrodiil. This was a very difficult fight. I’m not sure if we would have been able to defeat the NPCs- probably not, but it would have been a close call, but they weren’t alone, as some players came by to defend the mine. Then it was over quickly. This suspense- or tension, coupled with the open and vast zone design of Cyrodiil, really good loot, resource nodes and so on, are what i love about Cyrodiil. Of course, it wouldn’t have been half as much fun without the company, so there’s that. The funny thing is, the way the players in our guild are, we’re new to many of the things we do together. 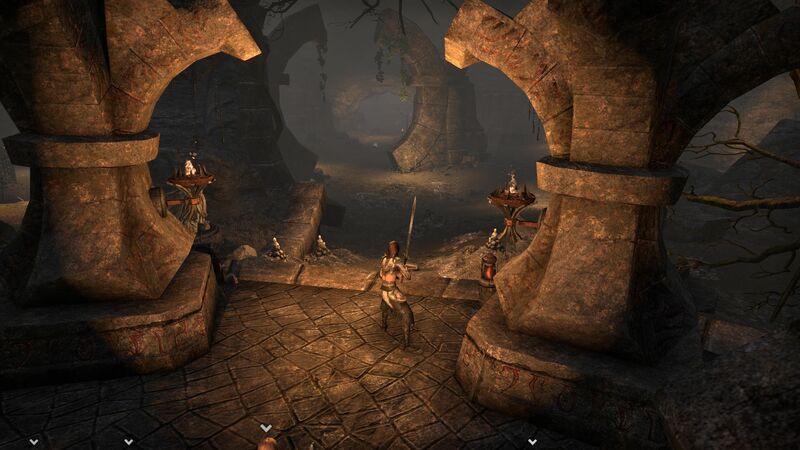 Many of us play Elder Scrolls Online because they like the IP. They played solo mostly and kept to themselves. So while we have veteran rank players in our midst, many of them haven’t seen a dungeon from the inside, and Cyrodiil, with its pvp nature? It’s new to all of us. So we’re basically noobs, but we’re having some great times together. Did i mention that i love this? Approaching the boss of the second delve- where are those DC players?